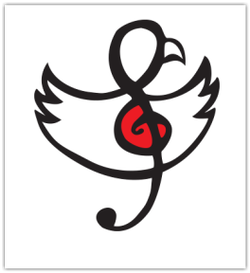 "I came up with the Carson Graham Music Department Logo in Drawing/Painting class this fall. We were asked to design logos for the Music Department and I was pretty excited to do so. I wanted to incorporate aspects of music into the logo, yet have a logo completely original and non-cliche that also encompassed the spirit of Carson Graham. Also I tried to stay away from designs with a particular musical instrument, since at Carson we also have a choir. So I was planning a logo that had the treble clef in it. From there, I added wings and a beak to turn the treble clef into a simple bird (eagle)".